The blossoming mobile gaming market has seen an impressive variety of titles come to devices over its relatively short lifespan. Lately there have been more and more huge 3D action games and racers, but most of these are simply too much for a mere phone. 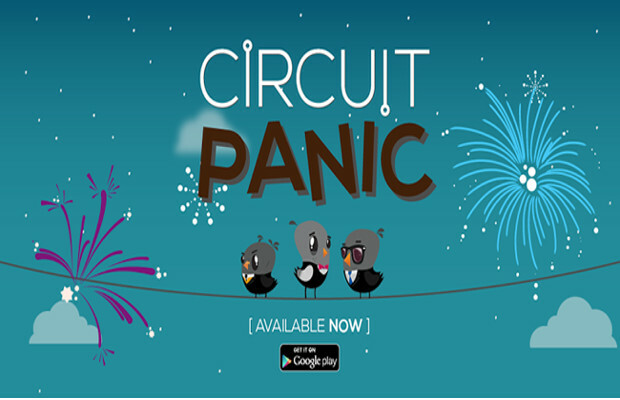 Vinyl Games Studio Inc. has opted to return to a somewhat simpler format with Circuit Panic. As it turns out, less is far, far more, and the developer’s focus on just a couple of elements makes for a pretty great game for Android. Circuit Panic follows three birds–Larry, Rob and Gus–desperate to fly south for the winter. The biggest obstacle is the power lines they choose to land on. These lines are dangerous, transmitting deadly electric currents every few seconds. The main goal of Circuit Panic is to survive long enough for the power lines to run out of energy. There are three power lines, and each bird can move freely along and between them. At each end of each power line is a lightbulb. The lightbulb will flash when a current is about to pass through. The color of the charge–yellow, red, or blue–will designate how fast the charge will go. You can either move to a different line to avoid these charges, or simply hop over them as they come, which yields more points. With each level come three different objectives, which range from catching score multiplier balloons, to avoiding a certain number of charges, to leaving all three birds completely intact for the duration of the level. These translate into a stars, which grant access to new worlds and levels. Additionally, powerups pop up randomly throughout each level. Each of these bestows a bonus that helps the birds along in their quest, such as a clock that slows time, a pair of boots to protect against shock, or a bandaged heart to restore a perished bird. These will appear and fade away quickly, so quick-reacting fingers are key in taking advantage of them. Hidden in the options menu is a fun little feature where you can dress up the birds with party hats, bunny ears, and so on. These change nothing beyond the cosmetic, but the dressing room serves an amusing distraction nonetheless. As is the trend in mobile gaming, Circuit Panic includes leaderboards, so you can see how other players are doing and try to compete with them. Even a tiny mistake can spell huge differences in terms of points, so netting those big numbers can be addicting–particularly with the allure of competition. Be ready for a challenge; this game is hard. The difficulty level ramps up alarmingly fast on some levels, particularly as some very demanding objectives start to emerge (maintaining a 32x multiplier for 10 seconds, for instance, is way harder than it sounds). The charges start shooting out much more sporadically, and things get even more complicated with lightning strikes. At times, it becomes less a matter of acting quickly and more a matter of being able to place birds in such a way that you’ll be able to better react when electricity comes your way. This isn’t a bad thing at all; in fact, with games seemingly getting easier all the time, it’s nice to have a game that you’re not immediately good at and have to practice with in order to be successful. A fraction of that difficulty, however, stems from mild responsiveness issues. The game doesn’t feel as tight as it could – or should – particularly considering the crackerjack timing and reflexes some of the later levels require. It feels like there is just a bit too much of a delay between tapping a bird and seeing him jump, and there are intermittent instances of a bird simply not responding when trying to get him to move horizontally or vertically. Trying to do too many actions in a row too quickly–for example, jumping, and then moving two bird in quick succession–usually results in one or more of them not responding. For some of the hairier parts, the controls need to be tight and responsive, and the difference between success and failure comes down to the milliseconds. Still, Circuit Panic is pretty addictive; there’s always the draw to try one more time to get that higher score, reach the coveted 32x multiplier, or avoid hitting that pesky blue charge. The challenge that comes with this can be frustrating, but in such a way that it rarely feels unfair, and offers the opportunity to improve. Things would be just a bit less frustrating with some improvements on the technical side of things, but apart from those responsiveness, issues, Circuit Panic is an amusing and engaging mobile game well worth both a look and the expense to get the full version.